Jean Charlot. 'War Drum,' 1950. Color lithograph. Gift of the Honolulu Printmakers, 1950 (12845). Jean Charlot (1898-1979) and his family arrived in Honolulu in June 1949 at the invitation of the University of Hawai‘i–Mänoa to create a fresco in the administration building, Bachman Hall. After living and working in many places, the move to Hawai’i would be the last—the Charlots stayed, and he became one of Hawai’i’s most respected artists over the next three decades. Within weeks of arriving, Charlot was at the Bishop Museum studying Hawaiiana in preparation for the mural. The collection of Hawaiian pahu, or drums, particularly attracted the artist’s attention, and he filled a sketchbook with drawings of various drums. Charlot would refer to the studies again and again for future works. Hawaiian drummers appear in the finished mural, Relation of Man and Nature in Old Hawai‘i, created over a five-week period in fall 1949. 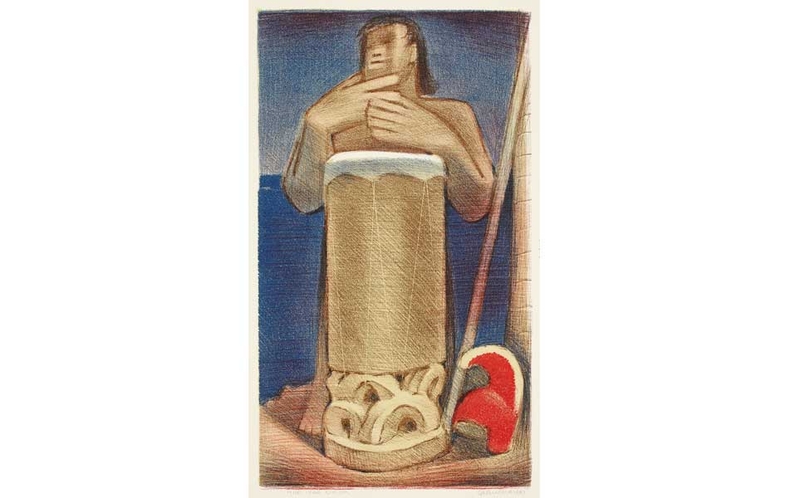 The Hawaiian drummer was one of Charlot’s favorite Hawaiian subjects, interpreted in dozens of variations in all media—frescoes and tile murals, paintings, drawings, and prints—over the rest of his career. His last Hawaiian drummer image was a color screenprint, Hala Grove, Kahuwai, Puna, Hawai’i, done in 1977. This exhibition presents for the first time an overview of Charlot’s Hawaiian drummer works drawn from local public and private collections. This exhibition is supported by a grant from The Jean Charlot Foundation.